Clearly, it's best to stretch all of your major muscles. Stretching promotes healthy blood flow and fluid exchange, which keep your muscles well nourished and relatively free of buildup of waste products, which lead to optimal function and lower risk of injury. If you're pressed for time and can't stretch all of your major muscle groups, I encourage you to at least spend a few minutes daily stretching your hamstrings. When compared to stretching any other muscle group in your body, stretching your hamstrings will likely give you the greatest overall return on your health. What are the benefits of stretching your hamstrings? The answer lies in the anatomy and function of this three-bellied muscle group. If you palpate the lowermost area of your buttocks, you'll feel your sitting bones, which are called your ischial tuberosities, one on both sides of your pelvis. Your hamstrings originate from your ischial tuberosities, and travel down the entire back length of your thighs, to insert on the bones that make up your lower legs (calves). While sitting on a chair, reach under one knee and feel for the tendons that represent the three muscle bellies that make up your hamstrings. Towards the outside of your knee, you'll find a single tendon that allows the biceps femoris belly of your hamstrings to insert into the outside bone of your lower leg (fibula). 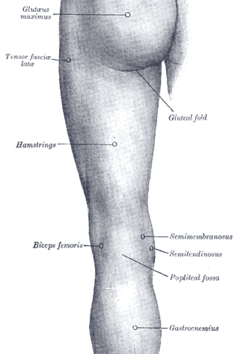 Your biceps femoris is actually comprised of two separate heads, one long and one short, but they both come together to become this tendon that attaches to your fibula. Now palpate the inner aspect of the back of your knee and you'll find two tendons side by side. These tendons are what allow the other two bellies of your hamstrings - your semitendinosis and semimembranosus - to insert into the main bone of your lower leg (tibia). In originating from your pelvis, spanning the length of your thighs, and inserting into your lower legs, your hamstrings directly affect two of the most important weight-bearing joints in your body - your hips and your knees. If your hamstrings are tight as you go about your daily activities, they'll create a downward pull on your pelvis, which can lead to dysfunction of your hip, sacroiliac, and lumbar spinal joints. Around your knees, tight hamstrings can create dysfunction between your knee cap and your thigh bone (femur). Tight hamstrings can also put pressure on your patellar tendon (the tendon below your knee cap that your doctor taps to test your reflexes), which can lead to patellar tendonitis or "jumper's knee." Because all weight-bearing joints in your body affect one another, tight hamstrings can indirectly be responsible for dysfunction and increased risk of injury from toe to head, beginning around your ankles, and extending all the way up to your upper cervical vertebrae. When I was in full time practice, I sometimes found that people with intermittent tension headaches experienced significant improvement from regular stretching of their hamstrings. Hopefully, you agree that it's worth your time to stretch your hamstrings at least a few times a week. If you aren't already doing this and can use some guidance on how to effectively stretch the three muscle bellies that make up your hamstrings, I recommend utilizing a simple hurdler's or side kick position. To stretch the hamstrings of your right leg, sit with your right leg straight out on the floor in front of you, knee close to being locked out (straight). Bend your left leg so that the sole of your left foot tucks in against your right inner thigh. If your hip doesn't rotate well enough to allow this, try rotating your hip the other way so that your left leg is slightly to your left side and behind you, like it would be in the hurdler's position. Keep your back relatively straight and strong. Slowly bend forward from your waist so that your chest lowers slightly towards your right leg on the ground. If you keep your back straight and strong, you won't need to bend forward very much before you start to feel a stretch in your hamstrings. You may feel most of the stretch right behind your knee where your hamstring tendons insert into your lower leg bones - this is fine, just hold your stretch for a good 30 seconds while maintaining even breathing, and as you feel your hamstring muscles and tendons relax, you can inch forward until you feel a solid stretch again, then hold for another 30 seconds. Keep in mind that you don't want to bounce or go to a point where you feel searing pain. The idea is to gradually stretch your hamstrings so that over time, they remain flexible and well perfused with blood. Stretching in this manner will indirectly lead to some stretching of the ligaments that surround your knees, hips, pelvis, and spine, so the benefits are multi-fold. If you can use some support in maintaining a solid stretch and constant tension while stretching, wrap a towel around the sole of your right foot and hold onto the ends with your hands, using the towel for leverage and remembering to keep your back straight and strong. Generally, I don't think it's a good idea to completely bend/flex your spine to bring your chest right down against your right leg (if you're able to), as in my opinion, this overly compresses the front portion of the discs that lie in between your vertebrae, particularly in your lumbar spinal region. If you have any weakness or history of injury in this area, stretching in this manner can actually put harmful pressure on the ligaments that line the back of your vertebral bodies, which can lead to a number of problems. Don't forget to repeat all of the above with your left leg. And whenever possible, it's best to stretch your hamstrings and other major muscle groups after a brisk walk or some other activity to get your blood flowing at a good clip. Generally, it's safer to engage in stretching later on in the day vs. first thing in the morning, as your body needs some out and about time to get your heart pumping blood to the far ends of all of your appendages. If you have any family members or friends who sit in front of a television for an hour or more a day and don't think to use such time to stretch, please consider sharing this post with them.